Directory Assistant is a small application for managing a LDAP address book. The focus is to create a very easy to use program, with only the few but necessary features. 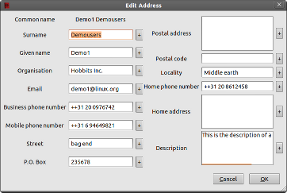 The target is novice users that have their addresses in an LDAP server. If you want an advanced application targeted at power users, check out GQ. 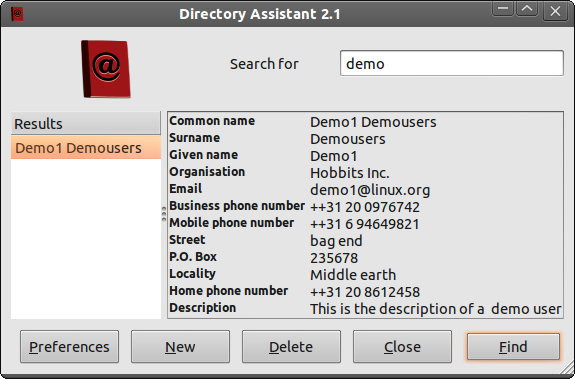 Directoryassistant 2.1 released!. After a long development pause, there is a new release. Directoryassistant now has a settings dialog and various small fixes, such as better handling for characters that need to be escaped and improved error messages. Debian includes Directoryassistant in the latest version, so Debian Sid users should be able to install Directoryassistant using apt. Unpack the tarball, cd directoryassistant-2.1/, edit the Makefile (by default it will install in prefix /usr/ but you can change that with the prefix line in the Makefile) and run sudo make install. There is very little development on directoryassistant, it just works. Bugs can be reported in our bug tracker.